Mike McKnight was born April 12, 1958, in Duluth Minnesota. He graduated in 1981 from South Dakota State University with a degree in Wildlife & Fisheries Management and a minor in Chemistry. Following a short time at the University of Idaho working on a Master’s Degree in Fisheries Biology, Mike attended the University of South Dakota School of Law and graduated with honors in 1986. Upon graduation Mike joined the firm and has practiced continually since 1986.During the course of his practice, Mike has represented hundreds of employers, their insurers and self-insurers across South Dakota. 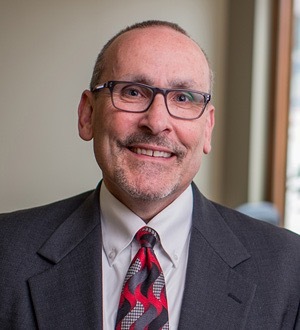 A partner in the employment law section, Mike’s vast experience before the South Dakota Department of Labor includes having tried over 150 cases in front of administrative law judges. In addition, he has handled administrative appeals to both the circuit court, the South Dakota Supreme Court and the Eighth Circuit Court of Appeals. Mike has also defended workers’ compensation bad faith claims and has an active practice as a mediator having mediated over 300 cases. Mike is proud to have been the first South Dakota lawyer selected as a Fellow in the College of Worker’s Compensation Lawyers. He is also proud to have been inducted in to the National Academy of Distinguished Neutrals and is a panel mediator for Resolute Systems, LLC. Mike has lectured extensively on the subject of workers’ compensation and employment law. He has also served as an expert witness for the defense in bad faith cases. Mike has been actively involved in the SD Bar having served on the Disciplinary Board, Ethics Committee and the ADR Committee. He was instrumental in establishing Kids Chance of SD which provides scholarships to children impacted by the injury or death of a parent in a work related accident. Mike is married with four grown children and has a passion outside the law for conservation and environmental related issues.